Six Rivers National Forest The complex consists of 19 fires. 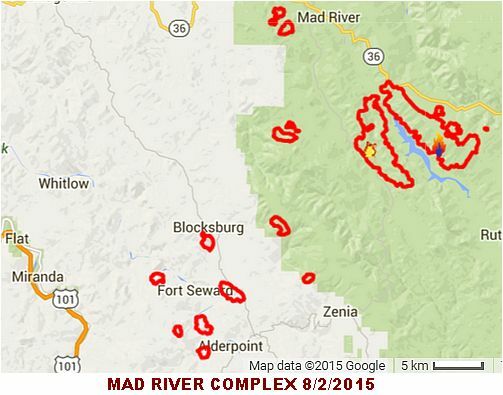 The Mad River Complex is a series of five lightning fires that started on July 30th, 2015. Crews have initiated structure defense and attacking the edge of the Gobbler and Pickett Fire around the Ruth Lake communities south of Highway 36. There are five fires that have been detected on the Mad River Ranger District and they include the Blake Mountain Fire, the Buck Mountain Fire, Lassic Fire, the Gobbler Fire and the Pickett Fire. Some of the fires are in remote areas with limited accessibility and will require days to access. Additionally, firefighters will be arriving throughout the next few days and begin to attack the other fires. 08/08/2015 0830: 17,852 acres, 30% Containment. Yesterday, firefighters made good progress in containment efforts on the fires in the Mad River Complex. Lassic Fire: The Lassic and Swayback Fires burning in the Mt. Lassic Wilderness cover an area of 1,771 acres. Crews were successful in establishing containment line on the southeast corner of the fire. The Lassic fires are located 5 miles south of the Rock Fire (Route Complex) and 3 miles north of the HUU fires (Cal Fire). Fire activity on any of these fires may affect the Lassic Fires, so fire managers are coordinating suppression efforts and sharing fire suppression resources. A spike camp is established at Scotts Glade to stage fire crews overnight closer to fire lines where they are working during the day. Gobbler Fire: Current size is 7,721 acres. Containment lines from a previous burnout on the northern portion the fire are holding well and crews are monitoring for any spot fires. The fire is backing down towards the Lower West Side Road (Road 1S06). Crews fired out the southeast corner of the fire last night and will reinforce fire line today. Pickett Fire: This fire is now 8,360 acres. Structure protection continues in the Forest Glen area and a voluntary evacuation advisory is in place. Fire managers are looking at options to construct line where needed and tie in to existing roads. Containment lines on the west side of the fire are holding. 08/05/2015 0830: 14028 Acres 8 %, Road closures are in effect for Highway 36 from Lower Mad River Road (County Road 501) east to Wildwood Road; Lower Mad River Road from State Highway 36 south to Three Forks; and Van Duzen Road (County Road 511) from Brown's Canyon Road south to Ruth/Zenia Road (County Road 502). State Highway 36 from Van Duzen Road to Lower Mad River Road is open to residents only. Voluntary Evacuations - for the communities around Ruth Lake, Mad River, and the Lassic area. 08/03/2015 0830: 13,127 acres, 5% contained. Active fire behavior with short range spotting. Threat to structures, power plant and distribution lines, Pickett Peak repeater and cell towers. Evacuations are in place for the Mad River and Ruth Lake area. Two structures have been destroyed. 08/02/2015 0830: 6,000+ acres, 0% contained. Complex consists of 19 fires that are merging into 5 large fires. CA IMT1 Team 5 (Minton) has been assigned. SOCAL IMT2 (Walker) has been assigned. 08/01/2015 0930: 1,500 acres, 0% contained. SOCAL IMT2 (Walker) has been assigned. 07/31/2015 1930: 400 acres, 0% contained. Type 2 team has been ordered. 07/31/2015 1330: 100 acres, 0% contained, Type 2 team has been ordered. Location: Near the Ruth Lake area Trinity County.